Well, in the interest of getting fully caught up, here's a box of hockey cards that I opened up a year and a half ago, scanned, and never got around to posting. 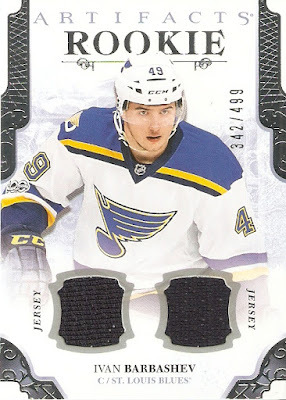 Back at the beginning of the 2017-18 season, I picked up the first big product of the season, with Upper Deck Artifacts. Each box contains 8 packs of four cards, including 4 serial-numbered parallels and rookies, and three autograph or memorabilia cards. So much time had passed between when I opened the box and got back around to the scans, that it was almost like opening it a second time! 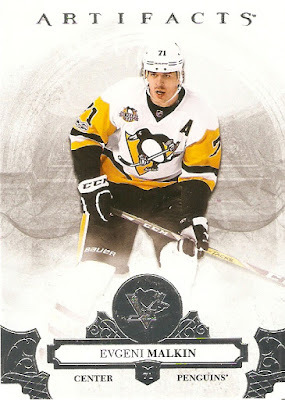 From the base cards, I pulled just one Penguin, Evgeni Malkin. 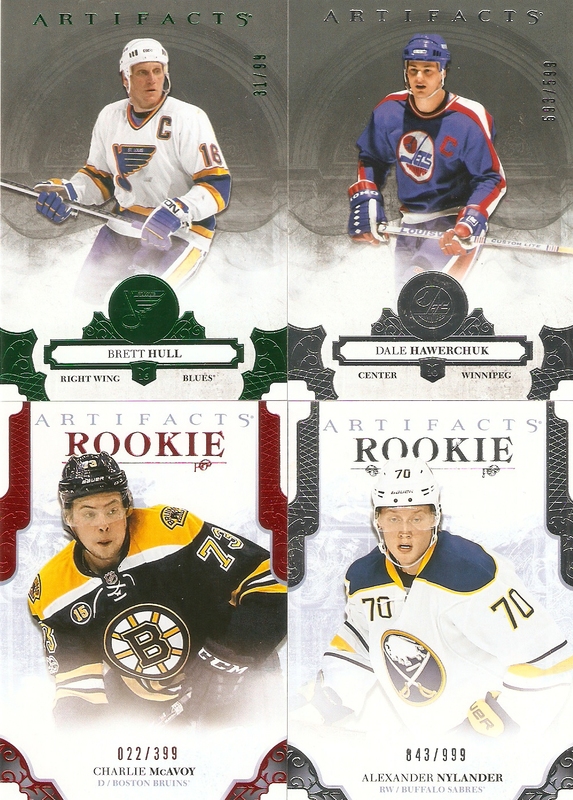 From the serial-numbered cards, I pulled a Brett Hull Emerald parallel numbered 31/99, Dale Hawerchuk SP 593/599, Charlie McAvoy Ruby Rookie 22/399, and Alexander Nylander Rookie 43/999. I was a big fan of Hull when I was a kid, so that was a great pull, and McAvoy was one of the top rookies in the league that season, so I did pretty well on these. 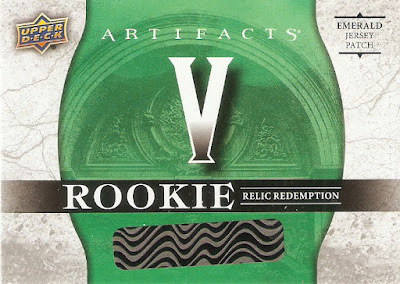 In addition to those four serial-numbered cards, there is also guaranteed to be one Rookie Redemption. 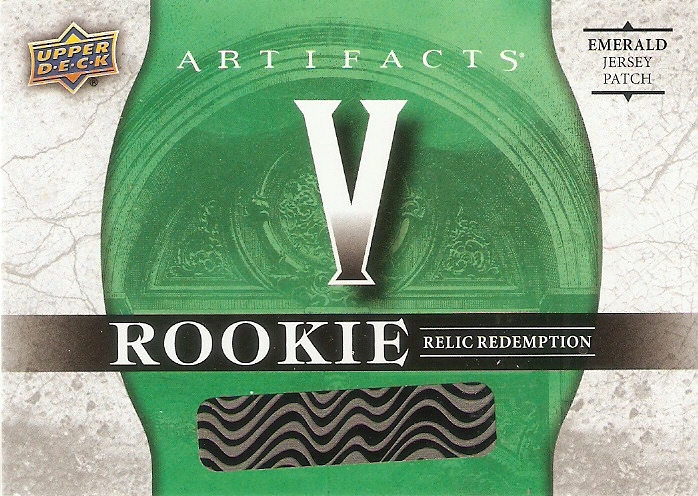 Artifacts is released too early in the season to include rookies who would make their debut early in the season, so these are inserted with the idea that they will be produced and sent out after they make their NHL debuts. I pulled two, an Emerald parallel numbered to 99 of Arizona Coyotes right winger Nick Merkley and a Wild Card Redemption numbered to 999 for Ottawa Senators center Filip Chlapik. Both are currently playing in the AHL. The first of my three hits was a dual jersey cards of St. Louis Blues center Ivan Barbashev numbered 342/999. He has spent parts of the past 3 seasons with the NHL team, but so far, has played all of 2018-19 with the Blues, scoring 6 goals and 8 assists in 49 games. 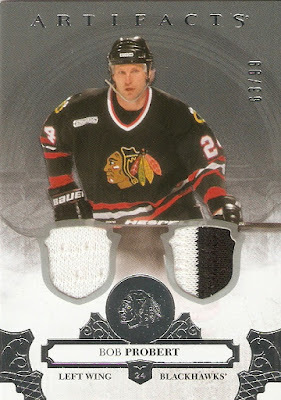 Next is a really cool Bob Probert dual jersey card, numbered 63/99. Probert was one of the premier enforcers in the game's history, splitting time between the Detroit Red Wings and Chicago Blackhawks. He finished his career with 3,300 penalty minutes, and in the final game at Joe Louis Arena, his family spread his ashes in the Red Wings penalty box. 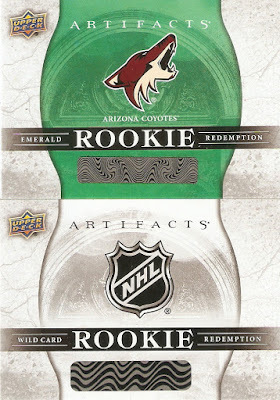 Lastly was, I suppose, the big hit of the break, an Emerald parallel (numbered to 99) Rookie jersey patch card of New Jersey Devils defenseman Will Butcher. He has proven himself to be an NHL mainstay, being with the team for all of the past two seasons, and has scored 3 goals and 19 assists in 51 games so far this year. Well hat's it for this box of cards...that I opened up almost a year and a half ago. Nothing too spectacular, but still, a nice stroll down memory lane for me. Probert was one of the guys who got me into hockey. Man I loved watching him fight.